William & Mary’s most recent main stage production, Joe Turner’s Come and Gone, opened this Thursday. Written by playwright August Wilson, it is steeped in symbolism, mysticism, and history. The plot of the story focused on the large northern migration of the African-Americans after the Civil War, the hardships they faced in their new environment, and their connections to their historical ties. While watching the play I was reminded of the same artistic conventions from the African American Art exhibition on show at the Muscarelle, the College’s on campus art museum. 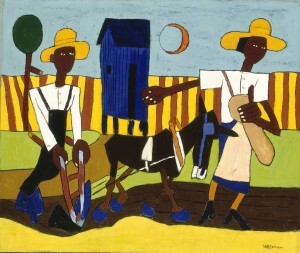 The images in the exhibition portray scenes of daily life of African Americans from the urban inhabitants of northern cities such as the painting by Allan Crite entitled “School’s Out.” Similar to the enthusiastic “juba,” a traditional African song and dance featured in Joe Turner, the painting captures the vibrant essence and cultural ties within the community. Both the play and the exhibition explore different African-American archetypes and how they relate to a collective identity. For example, in the play there is a character that is a conjure man or southern medicine man; similar to traditional African healers, he holds a pivotal and social role. Throughout the play he treats the spiritual and emotional illnesses that affect the other characters and his methods parallel certain rituals of Christianity. Likewise, Romare Bearden’s piece in the exhibition, In the Garden the “Prevalence of Ritual” Suite, depicts a conjure woman. Bearden’s print is an allusion to the biblical story of the Garden of Eden, and the woman is a symbolic representation of Eve. While in the garden she gathers ingredients for potions and divination practices. The correlation between the play and exhibit reveal characteristics of the social hierarchy and functions of members in this racially homogenous society. The play and the exhibition correspond in aesthetic themes as well. The majority of artwork in the exhibition is done in abstraction to express themes or the artist’s emotional response to the subject. The simple shapes and flat representations of figures winnow them to their most basic form, and examples of this style are in the paintings by William H. Johnson. The wall label notes, “[The scene] affirms the idea that southern blacks maintained connections with the cultural heritage of Africa. Though seemingly primitive, the flattened forms of and deliberately naïve perspective… were informed by years of artistic discipline.” In the same manner, the play had a minimalist set for portraying a boarding house and the religious hallucinations of one of the characters. The bare design prompted the viewer to focus on the underlying context of the play. Both the theatrical performance put on by the College and the show from the Smithsonian at the Muscarelle explore the context and history of African American culture. The similarities are more extensive than what I have written, and it’s interesting to compare and contrast the presentation of these common issues. As someone interested in the performing or visual arts, both have intriguing cultural representations of what it means to be African-American and celebrate the culture. This exploration of cultural identity and diversity is one of the many ways that W&M celebrates what sets our students apart as well as their commonalities. One of the aspects that I enjoy most about W&M is the sense of community that accepts, embraces, and welcomes such unique individuals. Joe Turner had it’s final showing this past Sunday, but the Smithsonian show will continue until January 6, 2013. 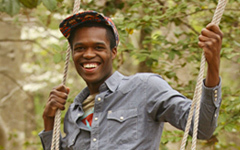 The cultural and ethnic groups, all of which are autonomously run by students, and the Center for Student Diversity, a branch of W&M’s Student Affairs, include the entire campus in this discussion about diversity. Although these programs are not permanent the conversation about diversity is, and it’s exciting to see the community engage in it.